Phenix Rods is a company that focuses on taking care of each and every individual client. When you purchase a Custom Quality Fishing Rod from Phenix Rods you are brought into the ever-growing Phenix Rods family. Phenix was founded on the idea that we aren’t just selling products we are selling memories, stories, and the ability to get the next big catch. 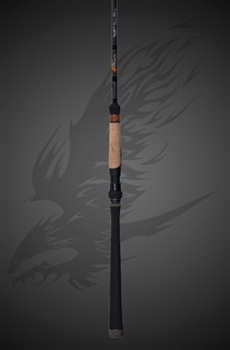 We carry several Saltwater and Freshwater Phenix Rods. If it is not on our website, please contact us and we will special order it for you. Usually takes 1-2 days to get. Finally, a balanced swimbait rod! Specifically designed to withstand the brutal casting of big baits with spectra, the Swimbait is the number one choice for intense anglers seeking aggressive monster bass. Rare in its own kind, the Elixir series trout rods is composed of our Ultra graphite and designed for the most demanding super light angler. Inspired by traditional high quality fly rods, the Elixir series delivers superb performance when targeting hard fighting trout and the utmost sensitivity that insures you never miss a beat. The Mirage is composed of an advanced Carbon Fiber we called Net V. Traditional glass blanks tend to be heavy, thicker in diameter and lacks backbone. The Net V gives the Mirage a very soft and forgiving action while maintaining a solid backbone. The thin diameter of the Net V blank permits the Mirage to be extremely light and balanced. The Mirage series features a 2 piece option that breaks from just above the handle. This allows for compact storage and travel while ensuring the performance of a one piece rod. The NEW Recon Elite Series is constructed with Toray’s state­ of ­the art T­36 ton carbon fiber woven material and is bound with Phenix Rods own proprietary Nanite Resins. The Recon Elite features NEW Essex T­-Ring premium carbide guides with FrameLok™ technology and is coupled with premium high density EVA grips and carbon reel seats. With a uniformly balanced lightweight blank, any one of the 17 models will deliver the sensitivity and strength demanding tournament anglers need at a price that is very affordable. Check out the NEW Recon Elite at your local tackle shop today so you can see what Premium Technology feels like. Abyss Saltwater Rod Series – West Coast Style! Constructed with Toray Graphite/S-Glass composites, the Abyss rod series is designed for "West Coast" style surface jig and live bait anglers. Traditionally, rod blanks of similar applications tend to be much heavier and have a wider base diameter, which often leads to casting fatigue. The Abyss Series utilizes the ideal strength-to-weight balance, yet ensuring superior lifting power. The vision at Phenix has always been to provide anglers with quality fishing rods for all levels of experience, from novices to pros. The Axis series utilizes the latest in material and design. Built with composite blends of S-glass, T-16 carbon fiber and graphite materials, while incorporating a multi-helix construction design, the Axis series is perfect for any saltwater environment. Dynamic in performance, quality, and sensitivity, but with the backbone structure to allow you to fish with total confidence. Keeping with our thin diameter and lightweight material, we feel the new Axis rod series is what anglers and enthusiast have come to expect from Phenix Rods! A new generation of saltwater blanks has been born. Using Toray’s high strength Carbon Fibers, the Black Diamond is created with a unique layering process and a “secret sauce” resin. This combination of aerospace technology allowed us to fabricate a super strong blank that has a thinner diameter and weighs considerably less than any other rods in its class. The Phenix Hybrid is the world's first fully woven Carbon Fiber blank. The blank is a unique blend of high strength woven Carbon Fiber and Kevlar. This innovative combination of materials is the latest technology from the aerospace and automotive industry. After years of R&D, Phenix has finally successfully applied this technology into fishing rod blank applications. Engineered to the concept of being lightweight yet unbeliveably strong, the Phenix Hybrid delivers an action that is far superior to any traditional glass or graphite blank. A new generation of saltwater blanks has been born. Constructed with Toray’s high strength Carbon Fibers, the Black Diamond uses a unique layering process and a “secret sauce” resin. This combination of aerospace technology has allowed us to give birth to a new age in blank technology. 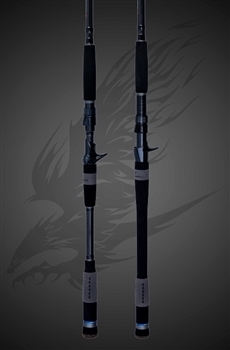 The Black Diamond series has a thinner diameter and a lower weight, allowing it to be the lightest rod in its class. Keeping true to the Phenix Rod brand the Black Diamond series holds true to the premium quality design and components.